What is Modulus of Subgrade Reaction in Foundation Engineering? At first we will provide an idea about subgrade reaction. Subgrade reactions is the pressure distribution that is developed due to reaction of a subgrade. The reaction is developed due to loads that are imposed to foundation structure. The determination of the modulus of subgrade reaction is a complex attempt as it depends on many parameters of individual types and density of soils. In this blog we are trying to describe the easiest way to determine civil engineering parameters. Here we will provide an set of empirical equations which depends on undrained shear strength for clay and standard penetration test for sand. This is worth mentioning that empirical equations are fairly good but we have to know where should they be used? We will discuss elaborately about modulus of subgrade reaction in next posts as this very important value that is used in designing foundations. 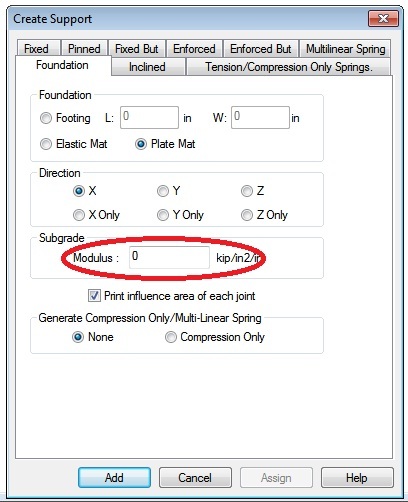 Now-a-days electronic solution of mat foundation are done using digital computer where mat foundation modeling having discrete elements are performed with this important parameter of moduli of subgrade reaction. modulus of subgrade reaction is not a soil property and mainly, based on foundation width in addition to soil properties. in the equation , is it 40-(minus)50Su or 40-(to)50 ?